Image Size: 28.7 X 37.8 in. 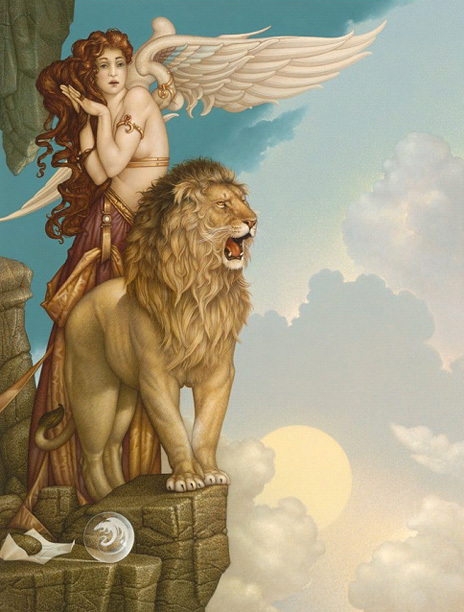 "My earlier painting, "The Last Lion", spoke of the end of lions on earth with his devastated deva waiting at his side until the end," says artist Michael Parkes. "She was his creator and was responsible for the species until its extinction on earth. "Here in "The Lion’s Return", a more recent work, there is hope. The lion will return. He will not go so easily and will fight for existence. Maybe he feels that mankind is slowly starting to realize how we must fight for our animal brothers. And in a way, I guess we are the animals’ keepers, their "devas," capable of deciding which species lives and which ones die. And so he roars, confirming his strength and determination to return and continue life on earth. "However, having said that, most of my paintings have multiple interpretations. A collector of mine told me that he takes daily inspiration from this piece on a very personal level as well as on a societal level. It reminds him that though each person or community has times when they are down and without hope, hope and passion and joy will return. And it is my personal hope that people will draw strength and confidence from "The Lion's Return."